In the 2000s, when the smartphone revolution began, manufacturers including Nokia, Samsung, Motorola, and others were able experiment with crazy designs - since there was no standard form factor for handsets (partially because screens were way, way smaller back then). Nowadays, though, most smartphones are made after a relatively similar design principle, so they're just thin rectangles. And there's not that much that you can do with a rectangle, is it? Even so, some smartphone designs can still be considered unique, and we're inviting you to discover them below. Announced in October 2013, the Samsung Galaxy Round was the world's first smartphone to sport a curved display (5.7 inches, 1080 x 1920 pixels). The Galaxy Round is basically a curved version of the Galaxy Note 3, as the two handsets share many of their features: Snapdragon 800 processor, 3 GB of RAM, 16 MP rear camera, faux leather on the back, and so on. Samsung didn't produce too many Galaxy Round units (at least not compared to the company's usual production volumes), so the handset saw a limited release. 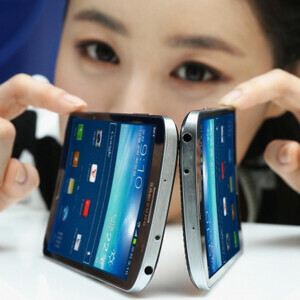 Mere weeks after Samsung unveiled the Galaxy Round, LG announced its own curved display smartphone: the G Flex. Unlike Samsung's device, the G Flex is curved from top to bottom, thus providing a totally different feel. Also unlike the Galaxy Round, the G Flex comes with a self-healing back cover, and is flexible (if you flatten it, it will regain its initial shape once you let it go). The handset is very large, as its screen is a 6-inch one with 720 x 1280 pixels. Other features include a Snapdragon 800 CPU, 2 GB of RAM, 13 MP rear camera, and a 3500 mAh battery. BlackBerry revealed the Passport in early 2014, though it didn't launch it until September. The Passport is definitely a rare sight to behold, not just compared to the all-touch smartphones of today, but also to other BlackBerries. The handset is really shaped like a passport, thus being much wider than regular smartphones. It has a square 4.5-inch touchscreen display with 1440 x 1440 pixels, and a 3-row hardware QWERTY keyboard below it (this is touch sensitive, so it can be used as a touchpad). Announced in September last year, at the same time with the Galaxy Note 4, the Galaxy Note Edge is Samsung's second smartphone to offer a curved display. But the approach is different here from what Samsung did with the Galaxy Round. This time, the South Korean company created a display that's curved on just one side, covering the right edge of the handset. The curved part of the screen doubles as a sidebar that can show notifications, app shortcuts, and other things. Other than that, the Note Edge is almost identical, specs-wise, to the Note 4. Samsung Galaxy Note Edge review. The AKA itself is just a regular mid-range Android smartphone, but the unique thing about it is that LG paired it with special cases that give it personality. When in use, these cases leave the upper side of the phone's display uncovered, so the UI can show animated eyes - there's a different character corresponding to each case color. The LG AKA was released late last year in South Korea, and it's now being introduced in other select markets around the world. Yup, the original G Flex has a successor - the G Flex 2 - which was officially launched earlier this year. The G Flex 2 retains the form and abilities of the original model (it's still curved and flexible, with a self-healing rear cover), but it's smaller and has better specs, including a 1080p display (5.5 inches), a Snapdragon 810 processor, and 3 GB of RAM. LG G Flex 2 hands-on. Obviously, the Galaxy S6 edge couldn't have been left out of our list. The s6 edge brings symmetry to the Note Edge concept by sporting a screen that's curved on both sides (though the curves aren't as prominent as on the Note Edge). Similar to the regular Galaxy S6, the S6 edge is a beast when it comes to specs, offering a 5.1-inch Quad HD screen, octa-core Exynos 7420 processor, 3 GB of RAM, and 32 GB / 64 GB / 128 GB of storage space. The Galaxy S6 edge hasn't been released yet, but it will be launched around the world starting April 10. Samsung Galaxy S6 edge review. From now on, there will probably be many other smartphones with curved and flexible screens. This seems to be the future, or at least a part of it, so we shouldn't be surprised to see all relevant handset makers adopting displays that aren't flat. What do you think the future holds for us in terms of smartphone design? Most innovative award goes to............. Samsung & LG. I can't pick which one has the better innovative phone! Let's see who comes out with this so called Bent/Foldable phone. No other than iPhone 6 Plus. LOL! LOL. I mean purposely and it still functions. It's time that Samsung gets rid of their Samsung logo in the front of their flagships. That logo was necessary when smartphones all looked the same, but the S6 Edge is the most unique-looking and the best-looking smartphone out there. No one will ever confuse it with any other smartphone. Yup. And so should every other OEM too. I know exactly what an iPhone or a Sony looks like. Why should their names be on there? In fact, let's extend this to cars too. I can distinguish a BMW from a Mercedes. These companies should all stop putting their names on their on vehicles as well. See the point I'm making here? Just because YOU can distinguish the phones doesn't mean EVERYONE can. The logos will always be there. Get over it. M7 is good-looking, but I wouldn't consider it unique. Well, each one of these phones have either a rounded screen or a square screen like Passport or the LG AKA that have a face like look. However the HTC Ones design is modern but not unique in that there is similarity to iphone and other phones. You may call HTC One m8 a unique design since it has 2 cameras on its back. Oppo N1 would be a nice addition to the list. I think you got a point here sir..
No sir, Iphone almost same shape same boring simple phone since 3Gs and I have the right to say so because I had 3GS, 4, 4S and Iphone5 for 5 years before I switched to Galaxy S4(happy) now S5 (very happy) And next month S6 and I would be extremely happy. I think, the curved is a not bad style than edge. But, to be honest, none of the above phone designs is attractive for me. I have a design for smartphone and tablet in my mind for months. Bezeless and different style. But, keep going OEM !! Break the boundaries !! ...in a perfect L shape form to fit contours of your cheekbone or to used as boomerang when you get bored of the os! Lumias, especially the 1020. Iconic without being genetic like all of apple's and most of Samsung's production phones. Some people are just plain STUPID..Nothing qualifies this as in anyway sensible,doesn't matter how much you earn,buying this sh*t is the height of gullibility..